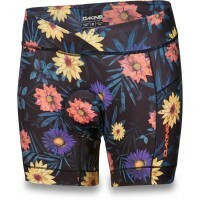 Dakine Women's Comp Liner Short is a inner pants / underpants with seat pad for use under the Baggy Pant and the cycling pants. Since the chic bike underpants Polygiene® is , it remains long odor , even if it go in the summer for mountain biking / Enduro things get really hot. The Comp liner is compatible with all major Dakine Bike pants for women , fits tightly, but is elastically that it does not cut . In addition, provide soft seams that it does not rub on the skin. the integrated seat cushion from the Italian Dolomiti Edition is specifically to the female Anatomy adjusted. It is made of both a 2mm and 4mm thick foam in 3D technology. This allows for a great fit and optimal damping during mountain biking . Customer evaluation for "Dakine Womens Comp Liner Bike Short Stargazer"